If the US Fifis in May was full of celebrities and show, the French Fifis in June had more the feeling of a large joyous family reunion. 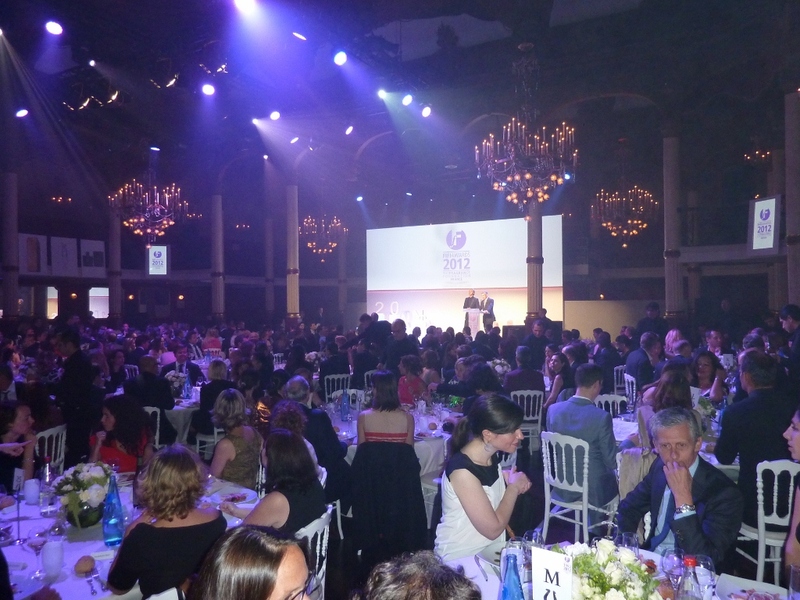 On one of the first balmy evenings of summer, the best and the brightest of the French perfume industry gathered at the elegant Salle Wagram – just down the street from the Arc of Triumph -- to catch up on each other’s news, feast on the best food and wine on the planet, and of course, award and celebrate achievement. Sabine Chabbert, (Assistant Director of The Fragrance Foundation France), Master of Ceremonies, Daniel Thevenot, (Journalist at France 2 TV Culture), and Nathalie Helloin-Kamel (Vice President of Elie Saab Parfums and Issey Miyake Parfums at Beauté Prestige International) listen as perfumer Francis Kurkdjian waxes sentimental while speaking of the pleasure of working with Elie Saab for his perfume. You wanted it. We have it. The Perfume Magazine's "Tour de Force" Paris Correspondent Sarah Colton, takes us on a passionate journey to the world-renowned French FIFI's. Join us for this exclusive look inside the French FiFi's. The only American website to do so. 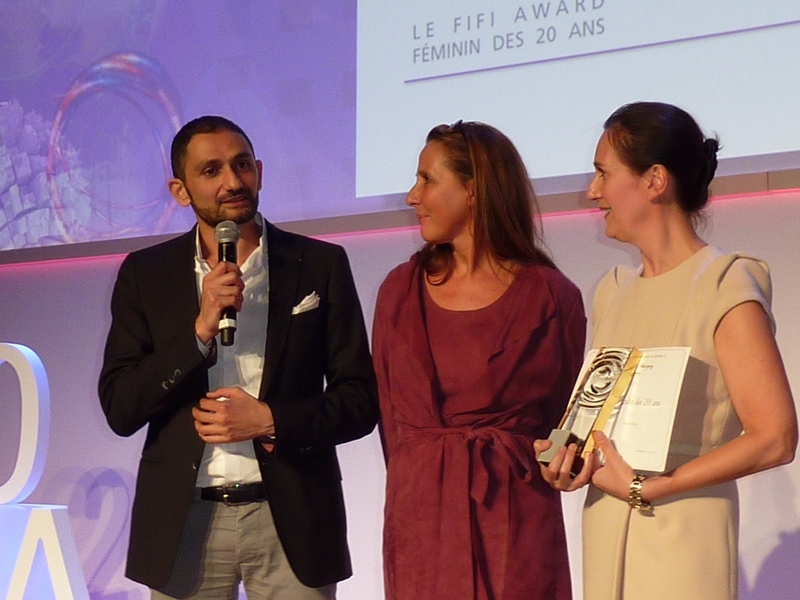 Isabelle Fulconis, International Marketing Director Jean Paul Gaultier Parfums and perfumer Annick Menardo (Firmenich) accept the Fifi Award for “Kokorico” for Jean-Paul Gaultier. 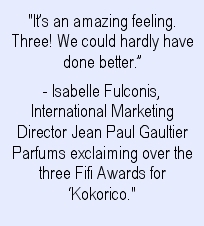 Co-perfumer Olivier Cresp was not present at the Fifis to accept the award. 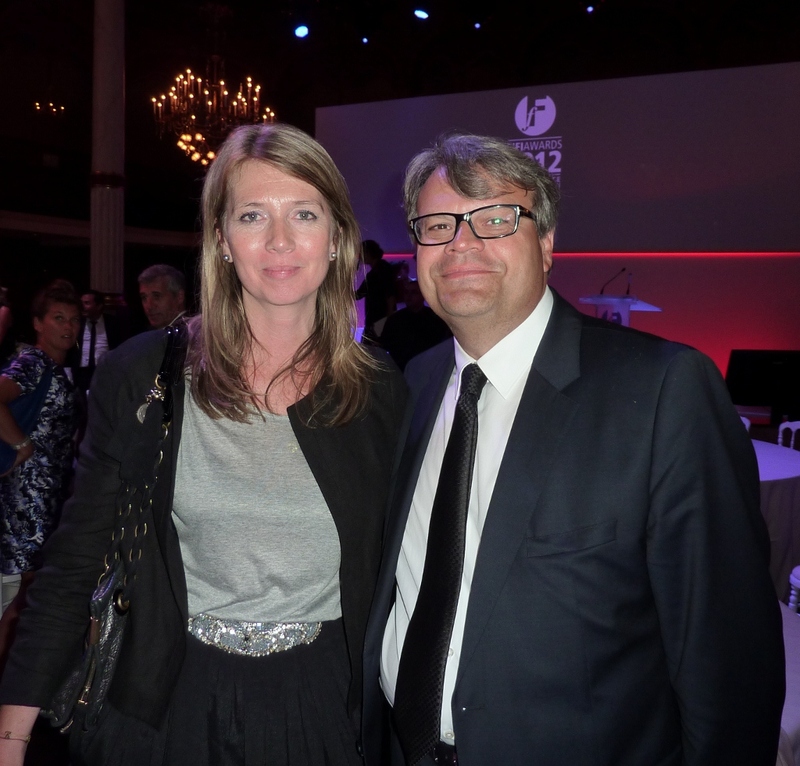 The Perfume Magazine’s Paris Correspondent, Sarah Colton, in action at the French Fifi awards. 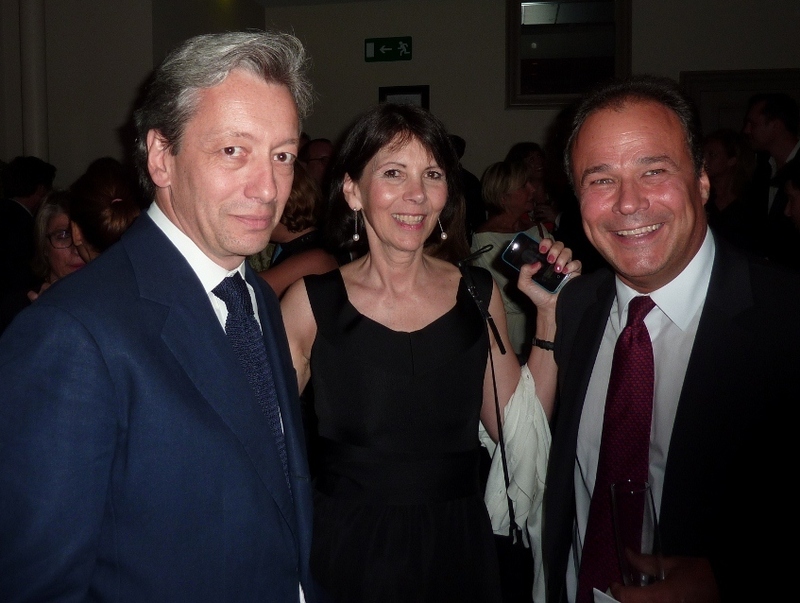 Seen here with Frédéric Malle of Editions de Parfums Frédéric Malle, and Laurent Bourdeau of Givaudan. 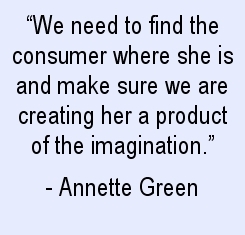 Annette Green, President Emeritus of the Fragrance Foundation and founder of The Fifi Awards in 1972, captivated the audience with the story of how she came up with the idea of the Fifis -- while sitting in a Parisian café! Annette also reminded members of the audience that any perfume they create must always be ‘a product of the imagination’. 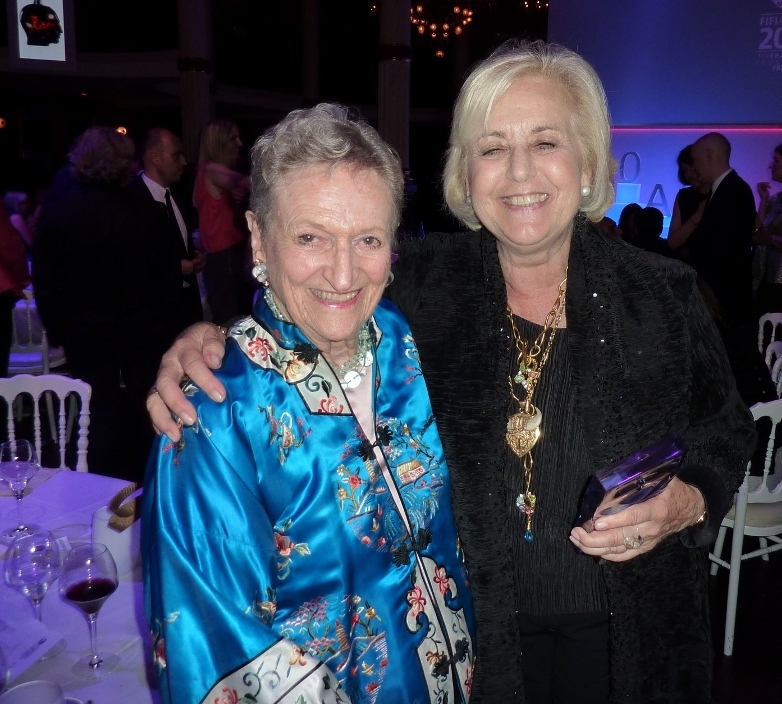 Catherine Disdet, President of the French Fragrance Foundation from its founding in 1992 until 2011, received the first Fifi of the evening, the “Special Board of Directors” Award. The atmosphere in the ballroom at La Salle Wagram, was particularly animated. This was, after all, the important Twentieth anniversary for the French Fifis so awards this year would be especially valued and coveted. As the dinner got underway, many a smiling face was certainly wondering who would, or would not, receive awards over the course of the evening. 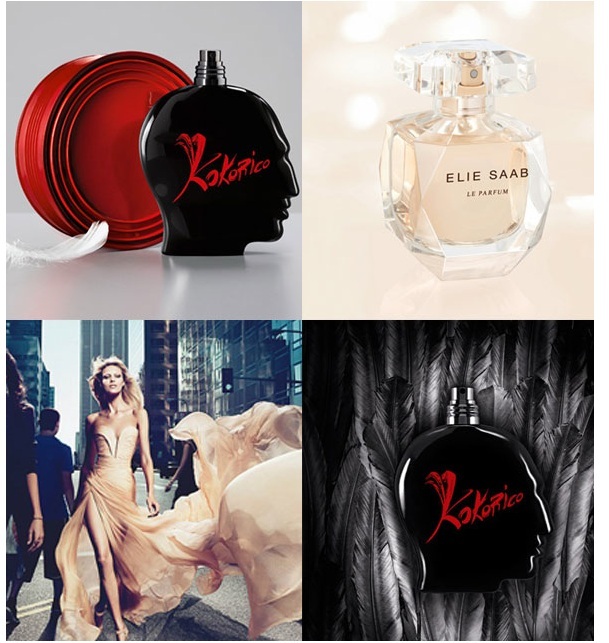 In rapid succession two fragrances, “Elie Saab for Elie Saab” and “Kokorico” for Jean-Paul Gaultier took the Fifis by storm, claiming three top Fifi awards each: Fragrance of the year, Best Bottle Design, and Best Publicity Campaign. In spite of fierce competition, top perfumers clearly respect each other and enjoy each other’s company. There was plenty of good humor to share, and one of the things I liked best about the evening was hearing old, and often funny, stories exchanged among friends. Some were competitors, others collaborate on a daily basis, and still others may have worked together earlier in their careers but have not seen each other in months or years. People in the fragrance industry may change jobs and even move from one company to another, but they tend to stay in the perfume industry. 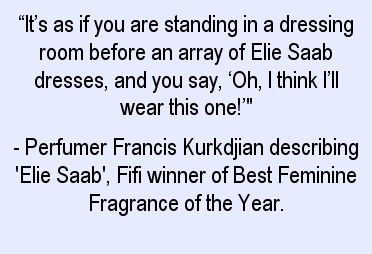 Perfume, it seems, is in their blood. 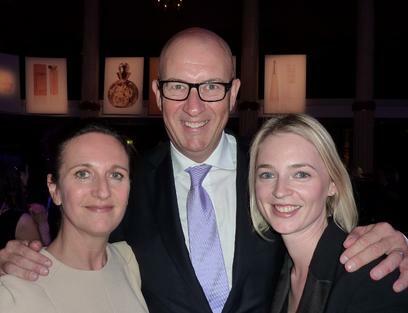 Philippe Ughetto, President of Arcade Europe, was obviously enjoying his role as President of the French Fragrance Foundation, and set a relaxed and expansive tone at the Fifis. 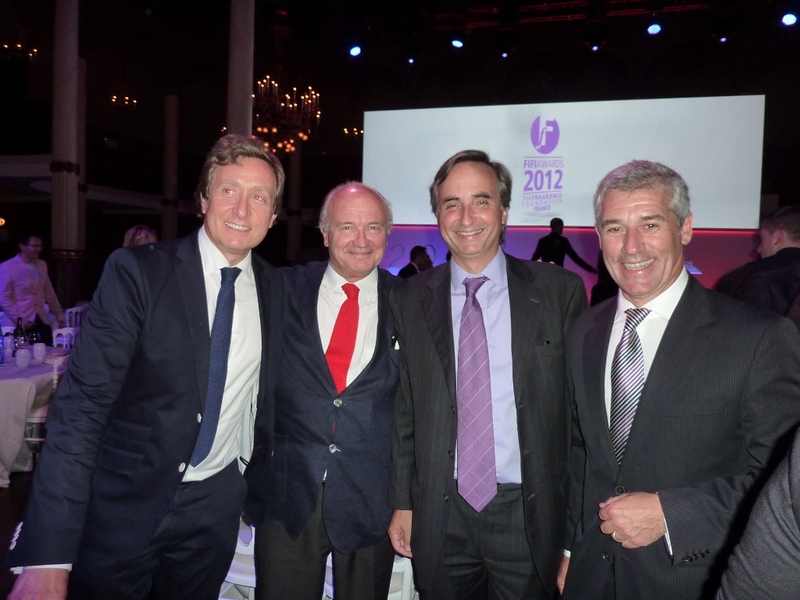 Seen here, on far right, with left to right: Xavier Renard of IFF, Armand de Villoutreys of Firmenich, and Patrick St.Yves, of the French Society of Perfumers. 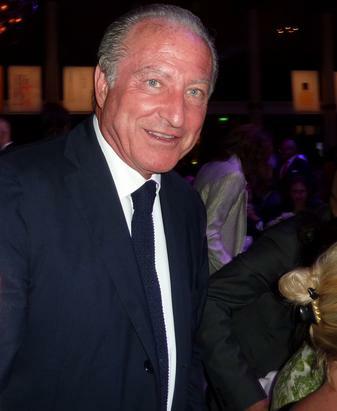 In Ughetto’s opening speech, he reminded guests that the Fragrance Foundation represents 80% of French perfume sales, and as one of the strongest economic sectors of the French economy, maintains a place of leadership for the entire world. Best Feminine and Best Masculine Fragrance of the past 20 years. 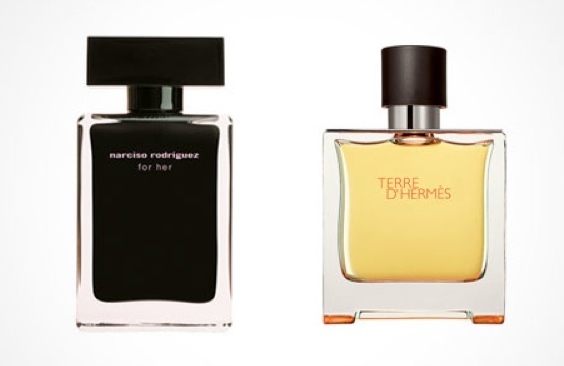 “Narciso Rodriguez For Her” for Narciso Rodriguez. 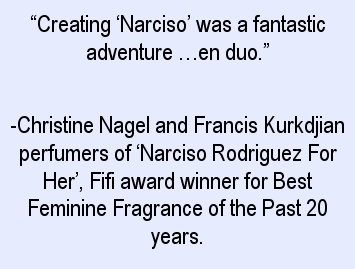 Perfumers: Christine Nagel (Mane) and Francis Kurkdjian (Maison Francis Kurkdjian). “Terre d'Hermès” for Hermès (perfumer Jean-Claude Ellena). Two fragrances by Beauté Prestige International amassed the top six awards for selective distribution. 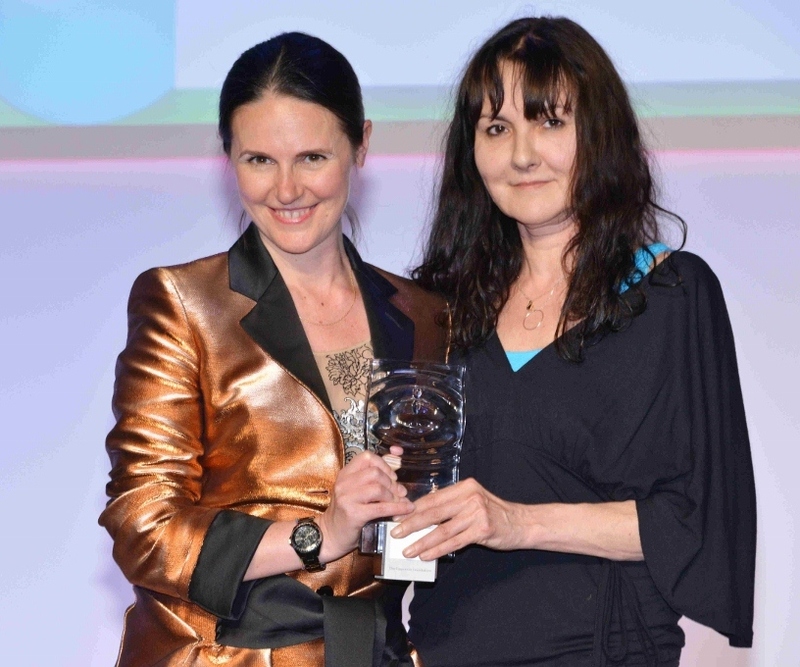 Best Feminine Media Campaign: Agence CLM-BBDO- Photographs Mert& Marcus. Best Masculine Media Campaign: Jean-Baptist Mondino. Feminine: “Pivoine Flora” for Occitane. 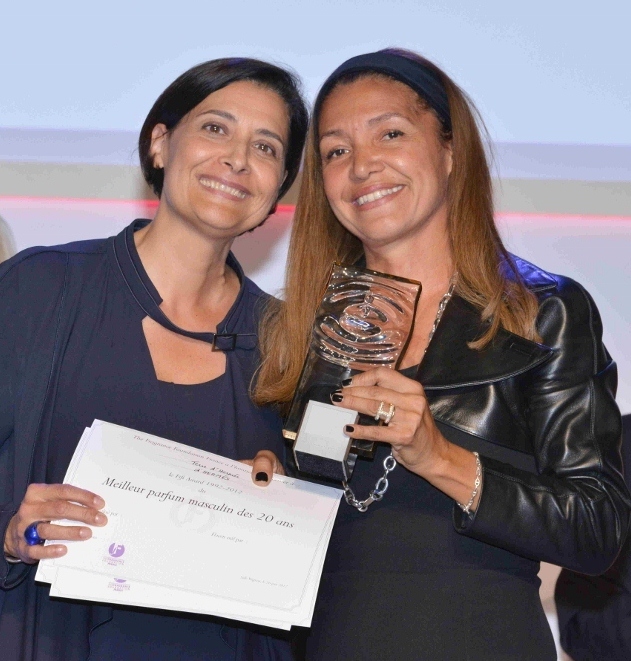 Perfumers: Dorothée Piot and Sidonie Lancesseur (Robertet). To celebrate the 20th anniversary of the French FIFIs two special awards were selected from winners of the previous years. Fifi dinner guests voted for this award during the dessert course by way of smart phone text messages. 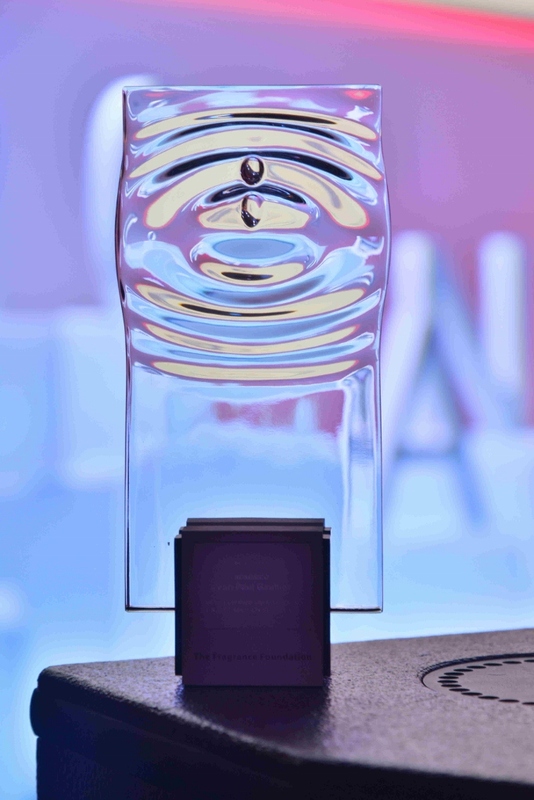 Finalists for this award were Fragrance of the Year Fifi winners over the past 20 years. For a complete list of finalists, refer to my article in the June issue of The Perfume Magazine. Perfumers Francis Kurkdjian and Christine Nagel enjoy a supreme moment of glory with Nathalie Helloin-Kamel of Beauté Prestige International as they receive the Fifi award for the Best Feminine Fragrance of the Past 20 Years for “Narciso Rodriguez For Her”. 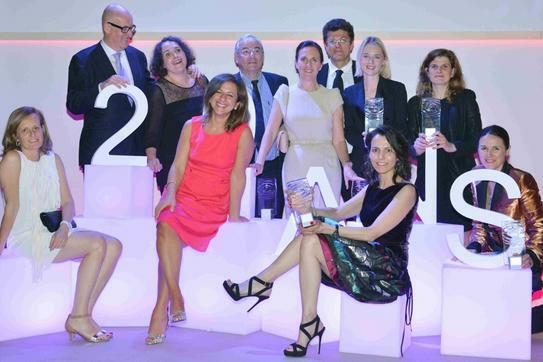 Undoubtedly, some of the happiest people at the end of the evening were Nathalie Helloin-Kamel, Vice President of Elie Saab Parfums and Issey Miyake Parfums at Beauté Prestige International, and Denis Quimbrot, Vice President International communication BPI. Denis and Nathalie seemed to get more energy with each succeeding trip to the podium -- seven in all -- to accept awards for BPI perfumes - three for “Elie Saab”, three for “Kokorico”, and one for “Narciso Rodriguez For Her”. They are pictured here with Emilie Legendre, Communication director for Maison de Couture Elie Saab. Members of the BPI team basking in the glory of their SEVEN Fifi Sweep. Patrick Firmenich, Veronique Gohmann of Yves Rocher, Jacques Cavallier-Belletrud, in-house perfumer for Louis Vuitton, and Nathalie Vinciguerra of Penhaligon’s. The Perfume Magazine gives a huge warm welcome to its new Paris Correspondent, Sarah Colton. 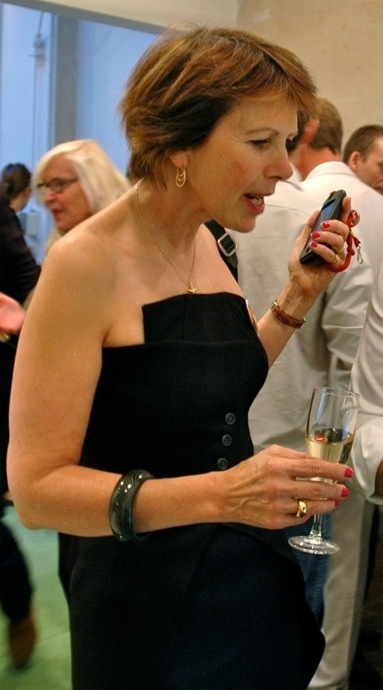 Ms. Colton is the quintessential "American in Paris" and has lived in Paris for over twenty years. Sarah Colton has the reputation of being one of the most passionate journalists one could ever meet in the perfume industry. She comes from a literary background, having a BA from the University of North Carolina at Chapel Hill. She quit her job as a legislative assistant of a US Congressman on Capitol Hill, cashed in all of her savings, and moved to Europe with nothing but a small canvas suitcase stuffed with dreams of adventure. Three years later she had completed a Master's Degree at the University of London and her articles and fiction have appeared in publications such as Glamour and Redbook. Continuing her adventures, she then met, Pierre, the Frenchman she would later marry. Ms. Colton has also published short stories various places, contributed articles to Paris Joyce (former French fashion magazine), and wrote her first novel, Tilt 68 which was published in 2008. She is also a featured journalist with her column titled "Notes From Paris" with the industry magazine, Beauty Fashion. Ms.Colton has written professionally about perfume and the fragrance industry for many years; highlighting leading French perfumers and French Perfume Houses. She has also been a guest lecturer for the "Friends of L'Osmotheque" in Paris. Ms.Colton also enjoys friendships with industry professionals and perfumers in Paris and her vast and in-depth "hands on experience" and contributions to the fragrance industry make her a perfect fit for The Perfume Magazine. She can be found at new fragrance launches in Paris and important French perfume events, happily enjoying all that perfume and her Paris life have to offer. She is currently working on second novel about leaving home and finding herself in a foreign place -- guess where?!. Sarah Colton divides her time between Paris, France and Asheville, NC.